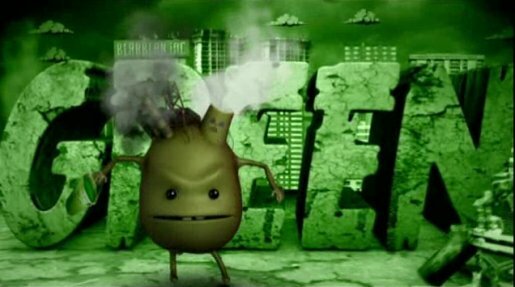 MTV Switch has launched a scathing critique of green populism in the Green Song, an animated music video. 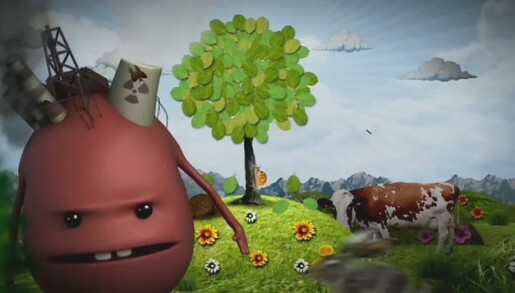 An animated character with nuclear reactor and oil wells on his head delivers a country song outlining the need for real solutions rather than marketing everything as green. The Green Song was developed at 180 Amsterdam by creative director Sean Thompson, creatives Rosita Rawnsley-Mason, Stacey Lee, Hal Kirkland, producer Sandra Durham, account director Kyle Marquis. Animation was directed by Michael Reissinger via Deli Pictures, Hamburg and Rokkit, with producer Martin Klauder, art director Robert Rhee, motion graphics and animation artists Robert Rhee, Eike Braselmann, VFX artist Christoph Zaplethal. Additional animation was done at PepperMelon, Buenos Aires, by art director Leandro Feuz, executive producer Fernando Sarmiento, character artist Juan Molinet, 3D artists Guillermo Kelly and Ignacio Godoy, assistant producer Lucia Ferrari. Post production was done at Glassworks Amsterdam. Filming was produced at Rokkit by executive producer Luke Jacobs. Music was composed by Lentink/Billinger & Marsman via Sizzer Amsterdam, with music supervisor Sander van Maarschalkerweerd. Vocals are by Bertolf Lentink. Lyrics were written by the 180 Amsterdam team. Sound was recorded at Kaiser Sound and mixed by Laurence Horne.